All adult organisms ranging from fruit flies to humans harbor adult stem cells, some of which renew themselves through cell division while others differentiate into the specialized cells needed to replace worn-out or damaged organs and tissues. 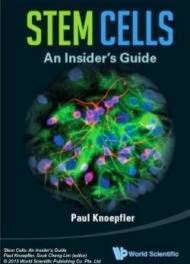 Understanding the molecular mechanisms that control the balance between self-renewal and differentiation in adult stem cells is an important foundation for developing therapies to regenerate diseased, injured or aged tissue. Now, in the latest issue of the journal Nature, researchers at the Stowers Institute for Medical Research report that competition between two proteins, Bam and COP9, balances the self-renewal and differentiation functions of ovarian germline stem cells (GSCs) in fruit flies (Drosophila melanogaster). "Bam is the master differentiation factor in theDrosophila female GSC system. In order to carry out the switch from self-renewal to differentiation, Bam must inactivate the functions of self-renewing factors as well as activate the functions of differentiation factors." said Stowers Investigator Ting Xie, Ph.D., and senior author of theNature paper. Bam, which is encoded by the gene with the unusual name of bag-of-marbles, is expressed at high levels in differentiating cells and very low levels in GSCs of fruit flies. Among the self-renewing factors targeted by Bam is the COP9 signalosome (CSN), an evolutionarily conserved, multi-functional complex that contains eight protein sub-units (CSN1 to CSN8). Xie and his collaborators discovered that Bam and the COP9 sub-unit known as CSN4 have opposite functions in regulating the fate of GSCs in female fruit flies. 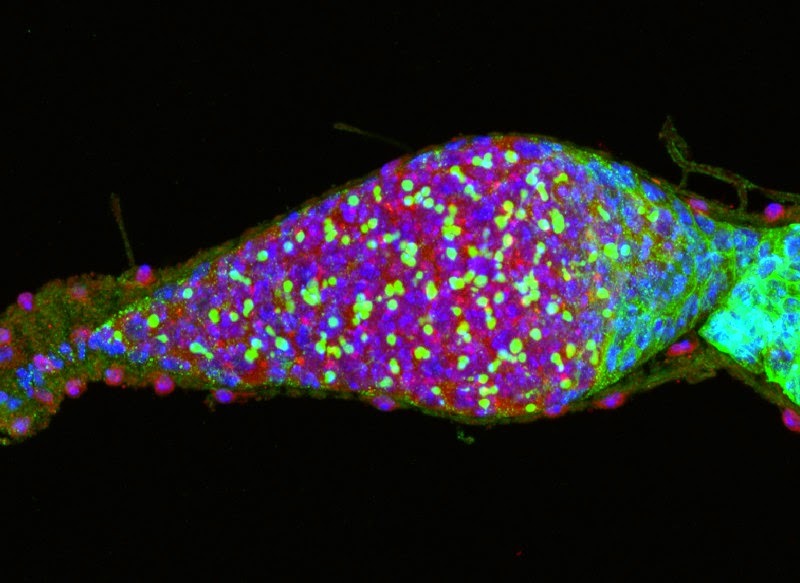 A bam mutant fruit fly ovary, known as the germanium, contains only adult stem cell-like cells (red) and spherical spectrosome (green). The accumulation of only adult stem cell-like cells indicates a mutation in the master differentiation factor bam completely blocks germline stem cell lineage differentiation. Bam can switch COP9 function from self-renewal to differentiation by sequestering and antagonizing CSN4, Xie says. "Bam directly binds to CSN4, preventing its association with the seven other COP9 components via protein competitio." he added. CSN4 is the only COP9 sub-unit that can interact with Bam. "This study has offered a novel way for Bam to carry out the switch from self-renewal to differentiation." said Xie, whose lab uses a combination of genetic, molecular, genomic and cell biological approaches to investigate GSCs as well as somatic stem cells of fruit flies. In the same paper, Xie's lab also reported that CSN4 is the only one of the eight sub-units that is not involved in the regulation of GSC differentiation of female fruit flies. "One possible explanation for the opposite effects of CSN4 and the other CSN proteins is that the sequestration of CSN4 by Bam allows the other CSN proteins to have differentiation-promoting functions." he said. "As a powerful model system for studying adult stem cells, Drosophila female GSCs have revealed many novel regulatory strategies which have been later confirmed to be generally true." added Su Wang, co-first author of the paper and also a graduate student in Department of Anatomy and Cell Biology at University of Kansas Medical Center. In their future studies, Xie says that he hopes to identify the molecular mechanisms that enable COP9 with CSN4 to promote GSC self-renewal and without CSN4 to enhance differentiation. The findings reported in Nature build upon previous research in Xie's lab to understand the molecular mechanisms that influence GSC self-renewal and differentiation. The lab previously found that Bam is required to repress the expression of E-cadherin, a cell-to-cell adhesion molecule that tethers adult stem cells to their tissue niches and promotes GSC self-renewal. Xie's lab also has shown that Bam inactivates the function of another promoter of GSC self-renewal, the eukaryotic initiation factor-4A (eIF4A), which plays a role in gene expression. Xie points out that studies in other labs have revealed that Bam also suppresses the expression of the protein Nanos. Like COP9, Nanos is regarded as essential to establishing and maintaining self-renewing GSCs in female fruit flies.